With Morningside Fall, Jay Posey's Legends of the Dustwalker saga is beginning to remind me of Brandon Sanderson's Mistborn Saga. Both series started off strong, with first novels that really impressed me with their imagination and their storytelling, and which guaranteed I would keep on reading. Unfortunately [minor spolier here], the second volume in both series suffers from the absence of the protagonist who made the first book so compelling. That absence made this a frustrating reading experience for me. The world building was taken to the next level, the threat of the Weir was far better explored, and we finally get something of a primary antagonist in the final portions of the book. In addition, the writing was just as solid as it was in the first book, contributing to an enhancement of the overall atmosphere. There really was a lot to enjoy and appreciate here, but Wren is no Three, and that's a very big 'but' indeed. I didn't like Wren much in the first book, and I didn't come to like him any better here. He's too innocent, too precocious, and too vulnerable. I wasn't necessarily looking for him to stand up and become a hero, but I was hoping he would serve some purpose other than to be the typical kid who needs to be rescued. He just rubs me the wrong way, leaving me exasperated and anxious to move on to the next scene that doesn't center on him. As for his mother, I really liked the darkness and the edge of Cass in the first book, but at lot of that seems blunted here. Sadly, it seems as if she's just not as interesting without Three there to challenge her on a personal and intellectual level. It's not a bad read, and the last 100 or so pages are worth sticking it out for, but it was a long, slow, difficult read getting to that point. I found myself skimming in places, and getting tired of all the walk-on auditions to replace Three as Wren's guardian. 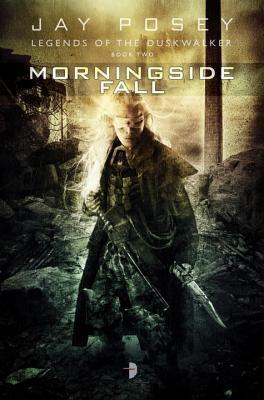 Morningside Fall definitely suffers from middle-book syndrome, adding to the issue of trying to replace a protagonist, but it ends with enough promise to make a third book a likely-to-read, if not quite a must-read. Hmm, normally I would say I don't know if I like the sound of that, but given this series so far and what I know about it as well as the author's style, I think this could be intriguing. If this sequel focuses more on Wren I'm very curious to see where his character will go, he was a bit too young in the first book to make me think much about him. I think that's much of my challenge with this book - Wren is still too young to really engage me at any significant level. Not so sad that I am behind in the series anymore then. I really enjoyed the first book, and there's a lot about this one that's fantastic, but one very big hurdle to overcome. how does the book work without a protagonist? Oh goodness so you're saying he hasn't really grown up any in character. I was expecting he'd be a badass in this one. I guess thats a good thing to know going in so my expectations aren't deflated like a hot mess.